I have posted the recipe for doughnuts which I copied from Jamie Oliver‘s book. So, I shall not repeat the recipe again. What I did was to add the peel of one lemon and two oranges into the dough. Then, I made a thick sugar syrup with the juice of one lemon and icing sugar. Dip the freshly fried donuts into the syrup and I got the most delicious doughnuts. However, it isn’t the doughnuts that taste good. My kids had so much fun cutting the doughnuts and shaping them. 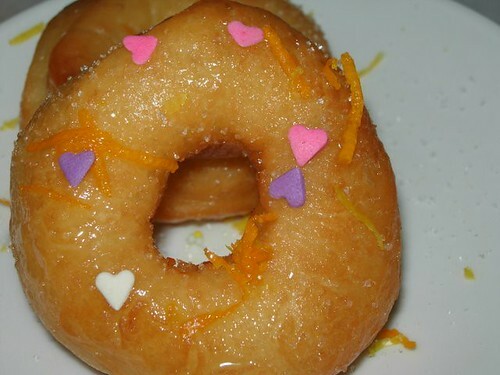 The orange and lemon peels give the donuts a very balanced taste because doughnuts are usually very oily. The citrusy fragrance made you want to wallop all of them. Trust me, it is very easy to make doughnuts. Just make sure that the yeast you prepare froth nicely and you cannot go wrong with it. I got a very big batch of donuts with just 500 grams of flour. jamie O loves lemon in everything! 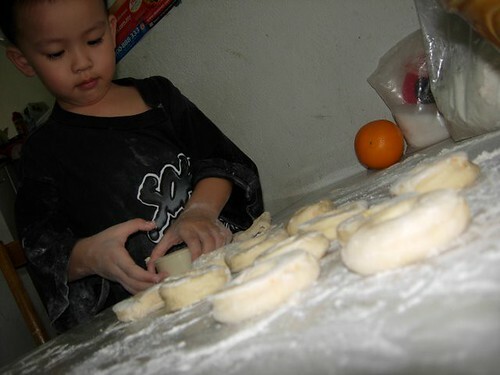 donuts looks yummy but i’m more captured by tt little boy.he’s cute n lovely; wanna pinch his cheeks! Your doughnuts look wonderful! Gorgeous!